My favourite Korean restaurant has a sushi menu; a popular Japanese restaurant nearby serves dim sum; the most upmarket Thai restaurant in my city has not only a sushi menu but also Szechuan dishes; and then there is Chef Pons Asian Kitchen, Empire Asia, and the inescapable Simply Asia outlets. I’d venture, in the past few years, counting the chains, most Asian eateries have gone pan-Asian. Some have taken it even further. Haiku at the V&A Waterfront has a combined pan-Asian and Indian menu. Kashmiri rogan josh, other Indian curries and Mongolian lamb have started cropping up on Southeast Asian menus elsewhere too. One of the very first (if my memory serves me well it was, in fact, the first) in Cape Town to have an extensive pan-Asian menu was Saigon. With bold signage and in a distinctive rounded building with panoramic views of Table Mountain, it has been a landmark since the 1990s. I’ve been going there for nearly 20 years, and was initially far from impressed. But since renovating in 2008, it has markedly upped its game. Inside, black lacquered tables and wooden floors make for an attractive dining space. The kitchen remains uneven, however. For starters, the “Indochine” dumplings are not as good as the Vietnamese rice-paper crystal spring rolls (goi cuon) filled with avocado, carrot, fresh mint and tufts of lettuce sticking out, accompanied by a black bean sauce. Some dishes are standouts, such as the generously portioned seared tuna on grilled aubergine (its predecessor, miso marinated kingklip on baked eggplant – before the menu changed two years ago– was even better). As is the wood-ear mushroom salad with lettuce, tofu, cashew nuts, finely julienned carrots, coriander, some glass noodles and a ginger-soya dressing. Other dishes, such as the caramelised fish in a clay pot and the rather watery curries are either disappointing in design or erratically executed. But the consistently friendly and good service has kept local diners in a forgiving mood. Steering for the middle-of-the-road, the salmon teriyaki (have it rare) is reliable as is the half roast duck (the barbecue sauce is better than the plum). Ironically, this pan-Asian pioneer has remained the only city restaurant with an ostensibly Vietnamese slant, such as the do-it-yourself wraps. People seem to enjoy stuffing spinach or lettuce leaves with their own fillings, chosen from ginger, lemon, chilli, nuts, onion, lemon grass, roasted coconut, prawns, fresh herbs, noodles, sprouts, and dipping it in sweet chilli sauce. Perhaps the dish for which Vietnam is known best in the West is pho (pronounced something like “fuh”), a traditional clear broth noodle soup. There are restaurants from Hanoi to California devoted solely to this dish. Some claim the name comes from pot-au-feu and it is the Vietnamese interpretation of colonial French consommé. Others say the broth accidentally came about from ­cooking bones clean to make bone jewellery. It can be made with chicken (pho ga), but most common is pho bo made with beef. A good pho bo takes many hours of slow simmering, and should be strained clear. It should be rich from high-quality marrowbone stock (using knuckle, neck, oxtail). Sweetness varies by region in its home country, but it is key to use yellow rock salt, not granulated sugar. Cinnamon, star aniseed, cloves and charred onions make pho distinctive as a soup, and it gets bite with ginger and bird’s eye chillies. The beef in it should be sliced and pink – like carpaccio – when served. The pho at Saigon is good, but they ought to be encouraged to do better. It should be a signature dish at a nominally Vietnamese restaurant. The pho bo is served “Asian style” in a large bowl (R75) or Western style in a medium bowl (R45) and accompanied with bunches of herbs, mung sprouts, a lemon and Hoisin and chilli sauce. 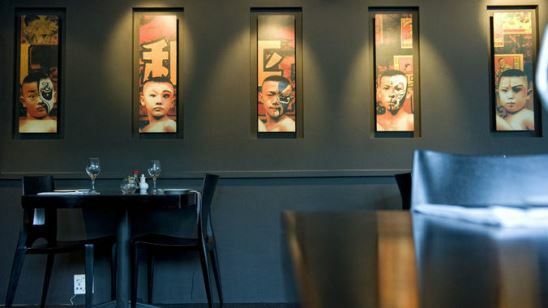 The only other Cape restaurant I am aware of that serves pho bo (readers are welcome to direct me elsewhere) is the relatively new and rather outré Indochine at the Delaire Graff Estate in Stellenbosch, where main courses start at R225. The pho bo at Indochine is R125. This is posh, international, fusion cuisine, with a won ton floating in the ­middle. But it was too sweet and overpowered by the cinnamon. Saigon does it better. Saigon, Shop F2, 2nd floor Rivonia Junction, 7th Avenue, Rivonia, Jo’burg. Phone: 011 807 5272. This article first appeared in the Mail & Guardian on 11 April 2014.